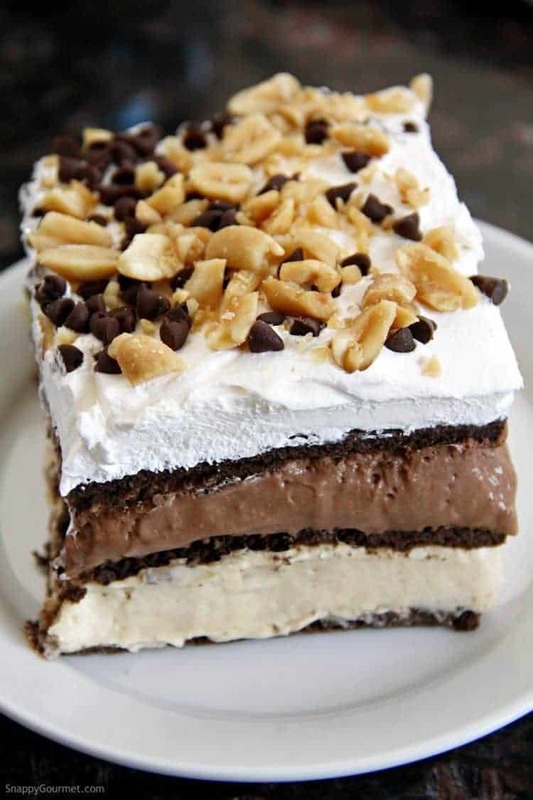 No-Bake Chocolate Peanut Butter Lasagna, an easy chocolate lasagna dessert recipe perfect year-round! This dessert lasagna recipe and graham cracker cake has a layer of homemade peanut butter filling and a layer of homemade chocolate filling. 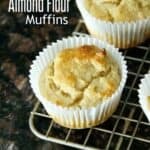 Easy ingredients and easy to make! 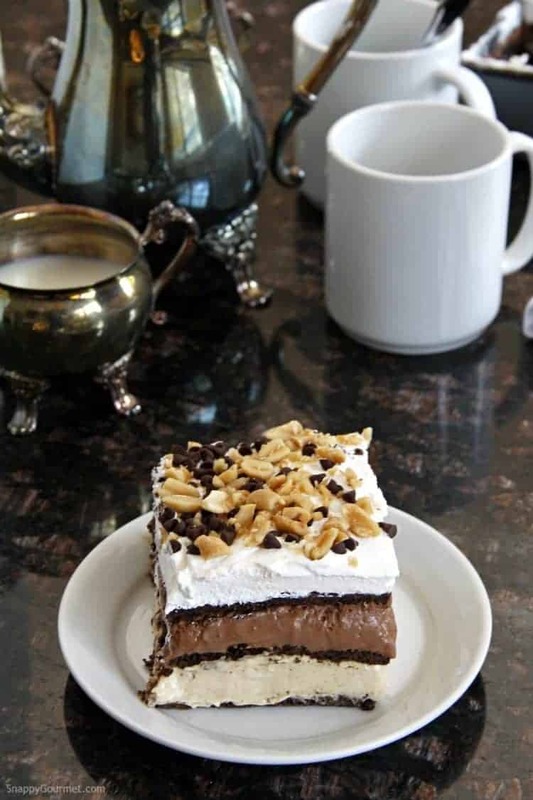 Also known as an icebox cake or refrigerator cake, this chocolate and peanut butter lasagna is the best dessert for a crowd since it’s delicious and makes a lot. The best! 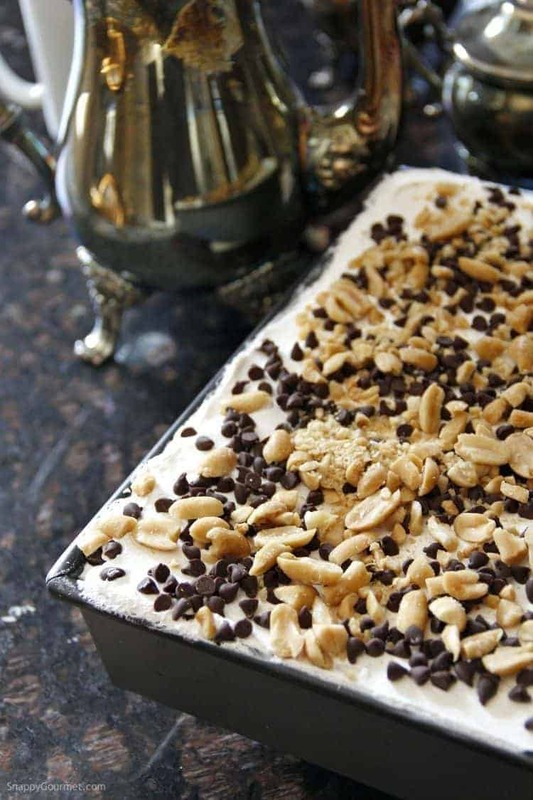 Today, I have the best No-Bake Peanut Chocolate Peanut Butter Lasagna recipe for you! This chocolate lasagna recipe FAR exceeded my expectations! So much in fact, I had to send most of it to work with my husband before I ate it all. 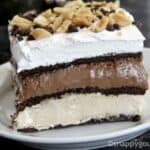 This layered no-bake chocolate lasagna dessert (or graham cracker cake) is the perfect potluck, holiday, Christmas, or anytime dessert recipe! I know there are lots of chocolate lasagna recipes out there, but most don’t include peanut butter. Thought about making a peanut butter lasagna recipe, but then it wouldn’t have chocolate. Chocolate and peanut butter recipes are one of my favorite combos so had to go with both! Ohhh how I love chocolate and peanut butter don’t you? 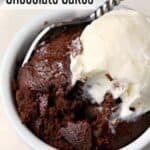 I have so many favorite chocolate and peanut recipes such as my Chocolate Peanut Butter Magic Bars, Chunky Peanut Butter Stuffed Brownies, and of course this chocolate lasagna recipe. I have no exciting story behind this recipe for chocolate lasagna. The truth is, I was craving a chocolate and peanut butter dessert recipe. Why? I have no idea, but I knew I wanted something easy. 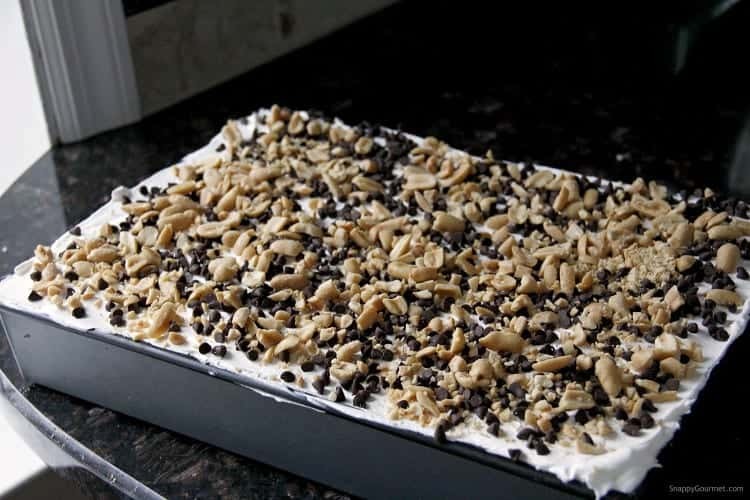 Next thing I knew I was in the kitchen creating this No-Bake Chocolate Peanut Butter Lasagna recipe and boy, oh boy, did it turn out GOOD! You’re not even going to believe how easy this chocolate lasagna recipe is and everyone will be amazed when they see all the layers! If you’ve never had a dessert lasagna before, I think you’ll love this. Yes, I know dessert lasagnas are not really like traditional pasta lasagna recipes so don’t send me hate mail. 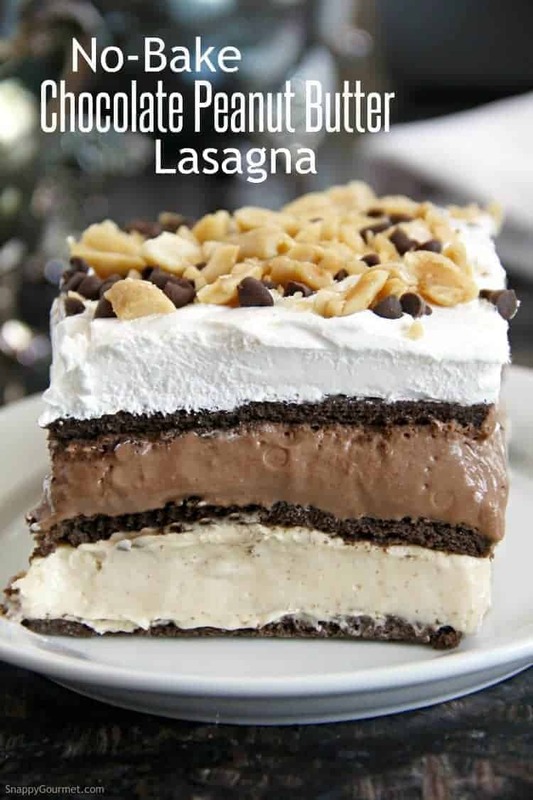 However, dessert lasagnas have layers. What’s in the layers can vary but definitely some kind of sweet fillings. Besides the sweet fillings they generally have other layers of cookies (such as wafers or Oreos), sweet crackers, graham crackers, or something like that. When these “lasagnas” are refrigerated the cookie/cracker layer softens and becomes cake like. 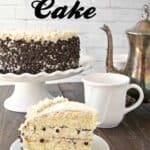 You may also know these type of desserts as “icebox cakes”, “refrigerator cake”, “graham cracker cake”, “graham cracker icebox cake”, or something along those lines. There are only 9 ingredients in this chocolate lasagna recipe so it’s quick and easy! 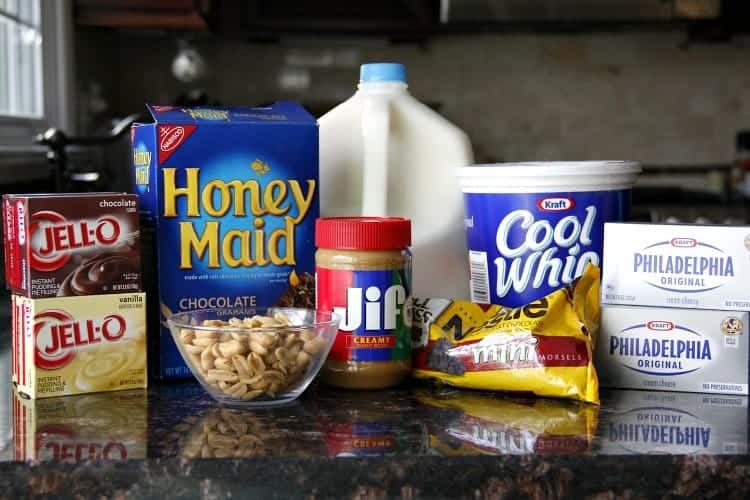 All the ingredients are easy to find including instant chocolate pudding mix, vanilla pudding mix, chocolate graham crackers, peanut butter, milk, whipped topping, cream cheese, chocolate chips, and peanuts. The first thing you do when starting to make the Chocolate Peanut Butter Lasagna, is make the chocolate sauce for the chocolate filling layer. Just add the chocolate chips and a little milk to a bowl then microwave until smooth. The chocolate sauce needs a little time to cool so that’s why I suggest doing this first so you have time to set it aside to cool. While your chocolate sauce is cooling, layer the bottom of a 13×9-inch baking dish with 1/3 of the graham crackers. Be sure to use a deep 13×9 baking dish so you can fit all the layers. I used chocolate graham crackers, but you could use honey graham crackers if you want. I strongly recommend NOT using the cinnamon sugar kind. I don’t think those would go well in this recipe. I broke my graham crackers into quarters, but you really don’t need to. The graham crackers get soft (almost cake like) with the filling so you could use full sheets of graham crackers then break some apart to fill in the edges. Do NOT worry if the pan is not completely covered in graham crackers, just spread them out a bit. Next, make your peanut butter layer. VERY IMPORTANT, make sure your cream cheese is soft and at room temperature. Otherwise, the cream cheese and peanut butter filling will be lumpy when you try to mix everything together. Also while make the peanut butter filling, be sure to add the milk very SLOWLY to help prevent lumps as well. When everything is well blended, spread the peanut butter filling over the graham crackers. An offset spatula works great for this. Then add another layer of 1/3 of the graham crackers. Again don’t worry if there are some small empty spots but try to cover as much as you can. Next, prepare the chocolate layer, and again be sure your cream cheese is at room temperature and add the milk slowly. Also make sure your chocolate sauce is cool before adding. Add the remaining graham crackers on top of your chocolate filling and your Chocolate Peanut Butter Lasagna is almost done! When you add the last layer of graham crackers, push down slightly if you need to make room for the whipped topping. This Peanut Butter Chocolate Lasagna may go all the way to the top of your pan that’s why I strongly recommend a deep pan. Spread the whipped topping on top of the chocolate graham crackers, then sprinkle the chocolate chips, then nuts on top. Cover loosely with plastic wrap or aluminum foil being careful it doesn’t stick to the top. Then, refrigerate the Chocolate Peanut Butter Lasagna at least 4-6 hours or overnight. You really DO need to let this sit in the fridge for the filling to thicken and for the graham crackers to get soft. When done, the graham crackers will be soft and cake like. Most people might not even know it’s graham crackers and will assume it’s cake! When you’re cutting the Peanut Butter Chocolate Lasagna, try to clean your knife in between slices so that the layers don’t get too messy. Also use a big spatula to lift the chocolate lasagna out of the pan and onto serving plates. This Chocolate Peanut Butter Lasagna recipe makes A LOT and could easily feed 24 people, or less if you want a big piece. 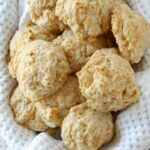 It’s the perfect holiday, Christmas, or potluck dessert since you can make it ahead and it feeds a lot! Also, this Chocolate Peanut Butter Lasagna keeps very well in the fridge for a while. 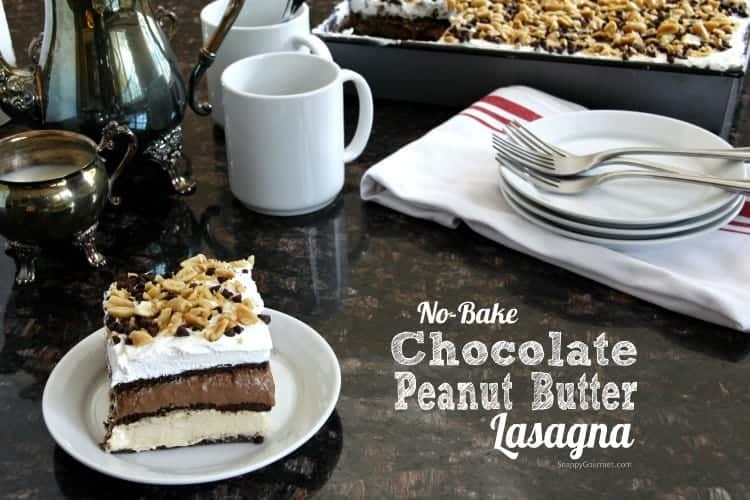 Hope you enjoy this easy No-Bake Chocolate Peanut Butter Lasagna recipe! 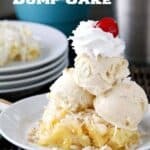 Be sure to check out my Potluck Desserts for more great easy recipes. ON PINTEREST? 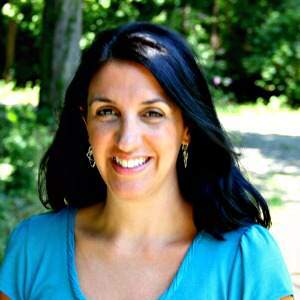 Follow me for great recipes, DIY, Crafts, Travel & more! 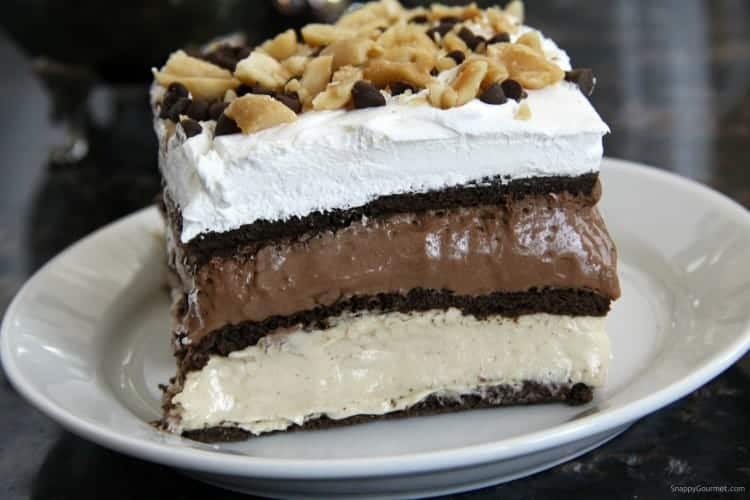 Easy No-Bake chocolate and peanut butter layered dessert like an icebox cake. Be sure to make ahead so the dessert lasagna can set up in the fridge. Place half of chocolate chips (6 oz) and 1/4 cup of milk in small bowl. Cover and microwave on high for 30 seconds. Stir until smooth, set aside to cool. 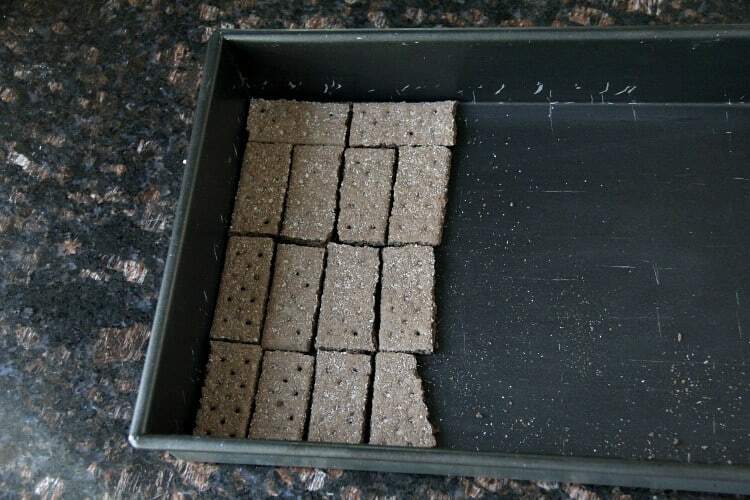 Place 1/3 of graham crackers into a single layer in the bottom of a deep 13x9-inch baking dish. Prepare peanut butter layer. Place 1 (8oz.) 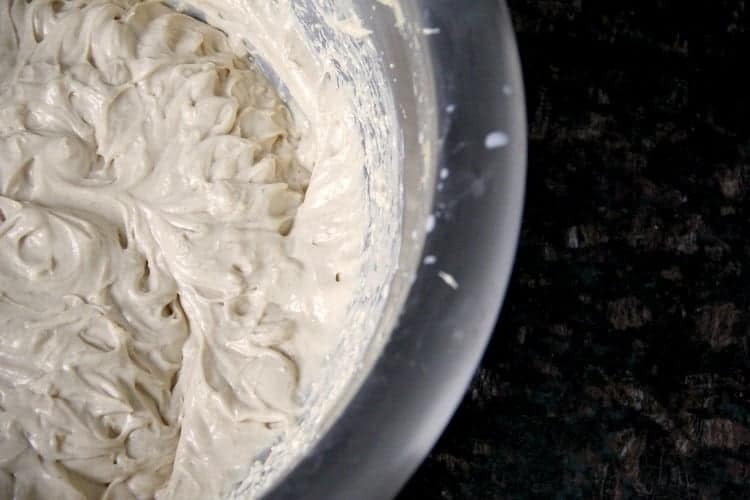 block cream cheese in large mixing bowl. Beat with electric mixer on medium speed until smooth. Beat in vanilla instant pudding mix and peanut butter until smooth. Very slowly add in 1 3/4 cups of milk while beating until well mixed and smooth. Spread mixture on top of graham crackers in baking dish. Place another 1/3 of graham crackers into a single layer on top of peanut butter filling. Prepare chocolate filling. Place remaining 1 (8oz.) block of cream cheese in large mixing bowl. Beat with electric mixer on medium speed until smooth. 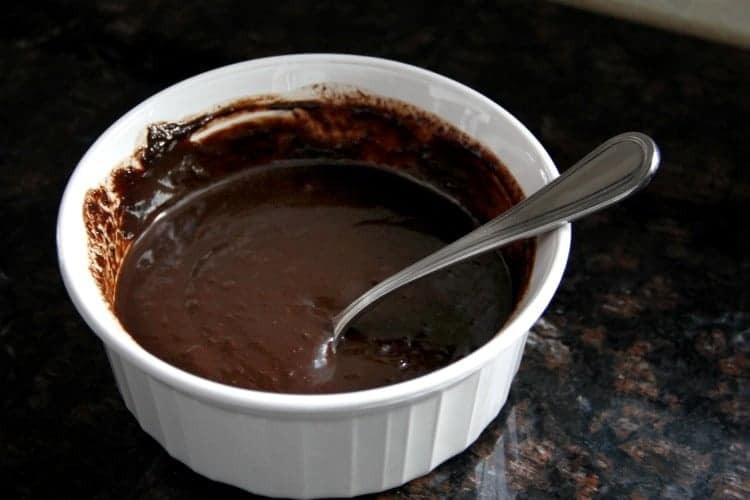 Slowly beat in chocolate pudding mix, cooled chocolate sauce, and remaining 1 1/2 cups milk until smooth. Spread mixture on top of graham crackers in baking dish. Place remaining 1/3 of graham crackers into a single layer on top of chocolate layer. Spread whipped topping on top of graham crackers. Sprinkle remaining chocolate chips then peanuts on top of whipped topping. Cover and refrigerate chocolate lasagna for at least 4-6 hours or overnight before serving. 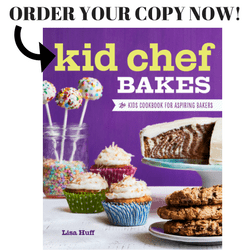 SNAPPY TIPS: Use a deep 13x9-inch baking dish to make sure all layers fit. 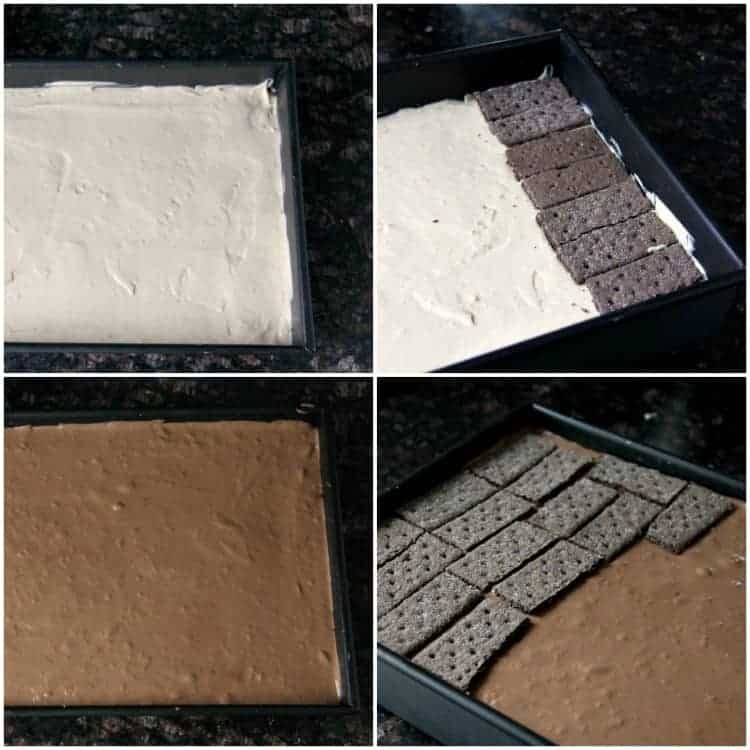 Be sure to let the dessert sit in the fridge for at least 4-6 hours to the layers can thicken and the graham crackers can soften to a cake like consistency. 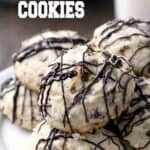 SNAPPY SUBSTITUTIONS: Instead of mini chocolate chips, you could use chopped chocolate or regular chocolate chips and semi-sweet, bittersweet, or dark chocolate. You can substitute any kind of nut butter and/or nuts for the peanut butter and peanuts.